Homer: Helllooo, my name is Mr. Burns. I believe you have a letter for me. Postal Clerk: Okay, Mr. Burns, uh, what's your first name? Please let me know of any inaccuracies or errors at adiumxtras [at] chrisstreeter [dot] com. Enjoy! It previously didn't work. 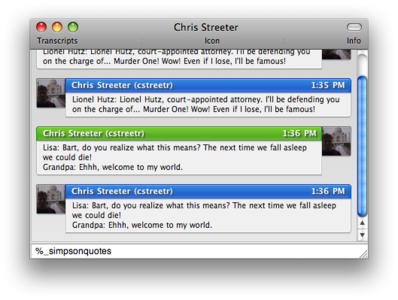 It should actually work now since before it was looking for the quote generator in the wrong place.